..GJ-EC.. Erik Cole. NHL UPPER DECK. Series 1. HOCKEY. Overseas=.. This item is a 2008-09 Upper Deck Victory BLACK Card #269 of Erik Cole. I would rate this card as least NM-MT or better. The edges are terrific, the image is well centered and the corners look good. Player: Erik Cole, Gilbert Brule. Team: Edmonton Oilers. Set: 2008-09 SPx Winning Combos. Sport: Hockey. Year: 2008. SetType: Insert. Manufacturer: Upper Deck Co. Item#: WCCB. Card shown in the scans is the exact card you will receive. Near mint to mint condition and no creases or other problems. GJ2-EC. Erik Cole. 2008-09 UPPER DECK. Series 2. Hockey. 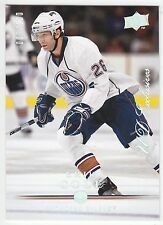 Overseas=..
You are purchasing a complete Master team set of Edmonton Oilers from the 2008-09 Upper Deck MVP Hockey set. The complete team set includes short-printed rookie cards from the entire 392-card regular set, and First Line Phenoms (FL), Magnificent 7’s (M7), Marked by Valor (MV) and Alexander the GR8 (AO) inert cards where applicable.